If an accident happened at work, your home or at a function you were attending or even if you were involved in a traffic accident, would you know what to do? Would you feel confident enough to be able to act in an effective way and deal with an emergency situation? We are a small first aid training organisation, who pride ourselves in giving the best up to date first aid training in an informal manner. We at Emergency Care NI can help. We deliver a full range of First Aid training courses to suit companies, schools, outdoor education centres, church group leaders, playgroup leaders, childminders and any individual who is seeking to learn first aid life saving skills. The courses are tailored to your requirements and are taught to the highest standards. Whether you are an organisation looking to train your staff, a community group or an individual wishing to learn new skills, Emergency Care NI can provide the course for you. 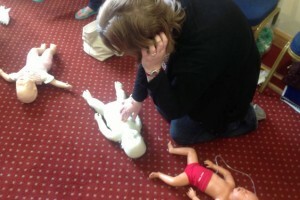 Training is delivered in a fun practical way, whilst keeping a serious focus on the first aid principles being taught. Courses can be delivered on your premises or in local venues at competitive prices.